PULP FICTION's Samuel L. Jackson brings his trademark cool to this hip animated series. Afro Samurai (Jackson) is on the hunt for vengeance as he follows the inappropriately named Justice (Ron Perlman, HELLBOY), who is his father's murderer. This mash-up of samurai life and hip-hop features the musical talents of Wu Tang Clan's The RZA. AFRO SAMURAI is available in regular and uncut versions. I am by no means a fan of Anime, but after hearing a few reliable sources go on about this film (actually a series in 5 parts), I decided to give it a try. 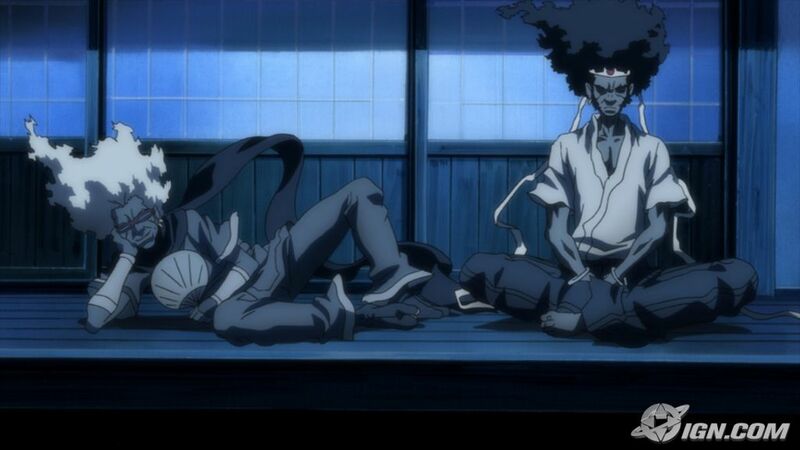 Afro Samurai, voiced by Samuel L. Jackson...what's not to like? It's acually a good story stemming from a basic revenge plot, with some pretty cool images and characters. I usually find Anime to be more style than substance, but this had both. VERY graphically violent, as is expected, but engaging as well. Even a little weird. Worth checking out. Could have been done in 1 or 2 parts instead of 5 as the story got pretty repetitive after part 2. Had video game style story line, seek revenge, meet series of bosses and finally the last boss, you win! Ironically to Mitch's review, I found Sam Jackson the MOST annoying part of this film. The side-kick character was probably the more annoying chars I've seen in a LONG LONG while. I enjoyed the animation, though. Same style was used in the snippet about the runner in The Animatrix. Fairly typical samurai-revenge-story, with Sam Jackson cranking it up a notch to excellent!